Why is there an epidemic of chronic illnesses that plagues 54% of our children today? Why do so many of our children suffer from ADHD, anaphylaxis from severe allergies, asthma, autoimmune diseases and epilepsy, in addition to other chronic illnesses and neurodevelopmental disorders? These questions remain largely unanswered and mostly ignored by the medical establishment as the numbers of children suffering from these conditions continues to rise. We live in a world where pharma-backed, government-sanctioned medical mandates in the form of liability-free vaccines with known serious potential adverse effects are forced repeatedly in greater numbers (70 doses of 16 vaccines by age 18) onto our most vulnerable and voiceless populations—with a disastrous outcome of life-altering iatrogenic illnesses, artificially induced in our children and youth. The main vaccine-producing companies, the “BIG 4” – Merck, GSK, Pfizer and Sanofi, who make all our children’s vaccines, list the very illnesses now seen in epidemic numbers in our children in their own vaccine inserts as potential adverse effects. In 1986, Congress passed the National Childhood Vaccine Injury Act (NCVIA), which gave liability protection to vaccine producers who were getting sued and losing in court for injuries caused by their vaccines. In effect, by reducing product liability, Congress through the NCVIA gave license to vaccine makers to produce substandard products by taking away the ability of the consumer to sue the vaccine manufacturers directly for injuries. The outcome of strategic, toxic early interventions in producing lifelong “sick customers” is not an accident— just follow the money. 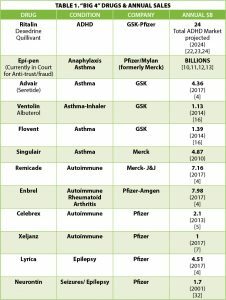 It is NOT A COINCIDENCE that the same BIG 4 companies, GSK, Merck, Sanofi and Pfizer, the largest manufacturers of vaccines in the U.S., happen to also produce the top grossing drugs that treat the most common side effects from their own vaccines: Autoimmunity, asthma, anaphylaxis, allergies, ADHD, rheumatoid arthritis, epilepsy, etc. In other words, our perception of vaccines as immunization agents is limited and myopic if we do not consider the “business model” they actually feed into. A blockbuster drug generates over $1billion in annual sales. Among these blockbuster drugs, Advair (GSK) has grossed almost $100 billion in sales to date, and is the 3rd best-selling drug in history. Remicade (MERCK) and Enbrel (PFIZER) are also in the top 10 of all drugs in history earning $90.3 billion and $81.2 billion respectively. Singulair (MERCK) has generated $47.9 billion and is among the top 20 drugs of all time . The above published article: Vaccines: Gateway Drugs by Design originated on Children’s Health Defense and is here by contribution with attribution to author Kristina Kristen and website childrenshealthdefense.org.